Color and design options – 30 Different Color + Visor Variations! 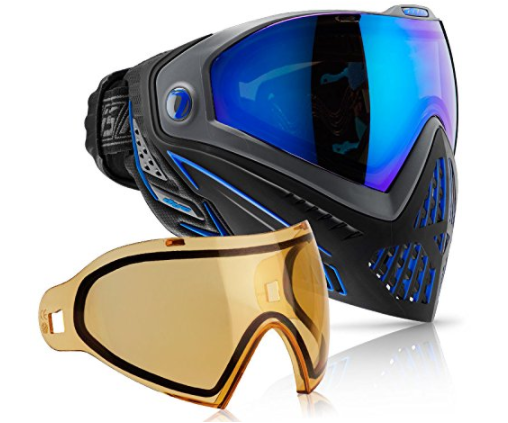 Buy the Exciting Dye i5 Thermal Paintball Goggles from Amazon NOW! Reviewing the Dye i5 is like reviewing a Rolls Royce. At a price point so high, the manufacturers have no excuse to leave any stone not turned when it comes to satisfying customer wants. And Dye have done exactly that. If you see the cons we have listed, it isn’t exactly complaints about the product itself but rather complaints about how it doesn’t match certain personal preferences. Yes, it is expensive, but you get a ton of features. Also, remember that the Dye i5 comes with a easily replaceable snap-on foam kit. 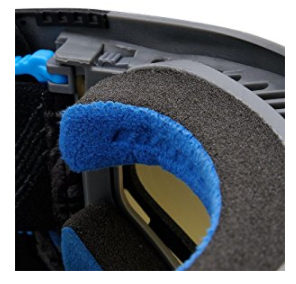 With most paintball players dumping a mask because the foam layer has started to disintegrate, the Dye i5 gives you a way to use this mask forever, by simply buying a foam replacement kit. As for the other cons, yes, it doesn’t offer full head protection, but most paintball players who want this mask don’t seem to care. And yes it doesn’t fit small heads. But it is more of a loss for players with small heads as they can’t use this incredible paintball mask. What first hits you when you wear this mask is the way the incredibly soft foam sits on your face. Though it gives you a premium feel, the comfort, protection and wear quality is simply supreme and unlike anything else you might have felt before. The foam is great at absorbing sweat as well. This is probably one of the reasons why this mask simply cannot be fogged up, because it keeps sweat contained in the foam rather than let it out into the mask that will then create condensation related problems that eventually lead to fogging problems. The GSR strap is a thing of beauty. 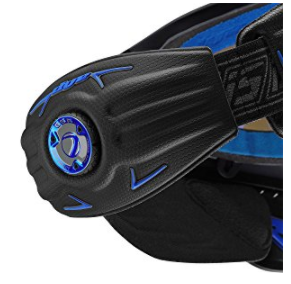 While most paintball masks come with straps that will have at least have a couple of “pinch” points, the GSR strap does a fantastic job of distributing the hold so evenly that you feel an extremely gentle grip when you wear this mask. But, despite its delicateness, the hold is solid and won’t budge even if you tumble, crawl and writhe your way through a difficult paintball field. The ratchet type adjustment using a single hand gives you a fantastic way to quickly secure your mask in place, should it ever come off or should you remove it to quickly catch a breath of fresh air. 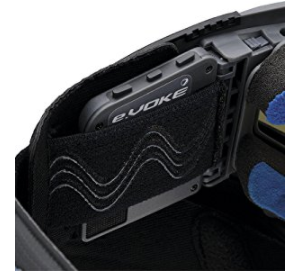 If you are the type of paintball player that like technology, you will love how you can simply slip in the e.VOKE wireless air sync into your mask, giving yourself the power of fantastic audio alerts. The POV camera mount is brilliant as well. Unlike other masks that give you a POV mount that is positioned in a rather odd position, the Dye i5’s mount is as “POV” as it gets, as it sits right in your line of sight, without affecting your vision of course. An anatomic fit and design, ASTM certification, super rapid lens change, advanced ear protection without affecting audio inputs and a very wide variety of style and visor choices just give you a thousand reasons to buy the Dye i5 paintball mask. Though expensive, it might be the only paintball mask you will ever have to buy, in your entire life! If $179 isn’t a problem as a spend, buy the i5 with your eyes closed! Buy it on Amazon here.